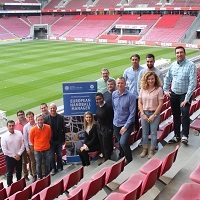 17 participants from 11 countries and four continents have been studying at the German Sport University Cologne since July 2018, aiming to complete the European Handball Manager certificate course in May next year. In what is the first attendance phase at the German Sport University Cologne, this week‘s focus will be on sports economics and basics of sports law, which will be taught by well-known and experienced speakers from both academia and practice. The reputation of the European Handball Manager study programme, which is conducted in cooperation between the university and the European Handball Federation, has spread internationally after three successful years. For the first time, handball managers from the USA, Japan and Australia are taking part, studying together with their European colleagues for one year. The participants have been preparing for the first attendance phase since July 2018, with the initial focus on sports economics and sports law topics complemented by governance in sport and strategic management content. Among the well-known speakers from science and practice are Dr Tim Pawlowski, Professor of Sports Economics at the University of Tübingen; Martin Hausleiter, Secretary General of the European Handball Federation; Stefan Ludwig, Partner at the consulting firm Deloitte and former Managing Director of DFB Wirtschaftsdienste GmbH; and Carlos Prieto Martos, former handball professional and winner of the Champions League in 1998, 1999 and 2006. After an intensive week in Cologne, the participants will continue with several weeks of self-study and eLearning before all meet again in the second week of January in Berlin to complete the second of a total of three attendance phases. In addition to the joint visit at the opening match of the World Championship 2019, talks and discussions with well-known representatives of international handball are planned.